Even without ISIS, the Middle East, the epicenter of radical Islam, is a complex political-military environment dominated by the Sunni-Shia religious conflict, but influenced by ethnic aspirations, tribal rivalries, regional hegemony, superpower competition and ever-shifting allegiances. For example, Turkey under the leadership of Sunni Muslim President Recep Tayyip Erdoğan opposes the Syrian regime of Shia Muslim President Bashar al-Assad. Turkey is a NATO-member and ally of the United States. Assad’s government has strong diplomatic and military support from Russia, is a long-time ally of Iran, and is backed by Lebanon’s ShiaHezbollah militant group. Yet, such differences are superseded by their mutual fear of and animosity towards Kurdish independence or autonomy. On August 18, 2016, Turkey and Syria engaged in what appeared to be a coordinated attack against Syrian Kurdish People’s Protection Units (YPG) in and around the city of Hasakah. The fighting in Hasakah came after the Syrian Democratic Forces (SDF), whose main component is the YPG, captured Manbij on August 13th, a strategically placed town in north Aleppo province. Four days earlier, Turkish President Erdogan had met with Russian President Vladimir Putin and appears to have obtained his acquiescence to a limited Turkish military intervention in northern Syria. The Turkish-Russian, at least temporary understanding, relieved some of the hostility in the wake of the shooting down of a Russian fighter-bomber by a Turkish jet on November 24, 2015. In its battle against ISIS, the US supports the Syrian Democratic Forces (SDF), which is an alliance of Kurdish, Arab, Assyrian, Armenian, Turkmen and Circassian militias, but it is really a wholly owned subsidiary of the YPG. The umbrella organization of the SDF provides diplomatic cover for the US because the YPG is considered by many as the Syrian branch of the Kurdistan Workers Party (PKK), a group designated as a terrorist organization by the US and NATO and one that has been waging war against the Turkish state since 1984. In regard to ISIS, it is an ambiguous operational environment offering only poor options and one largely of our own making. If the strategy of George W. Bush can be described as naïve and punctuated by neoconservative hubris, those pursued by Barack Obama and Hillary Clinton represent the intersection of ideology and incompetence. In the wake of 9/11, the Bush Administration, sought a long-term political solution to international terrorism, which they believed emanated from the lack of democratic participation, where resentful individuals, having been excluded from the political process in their own countries, directed their hatred and violence against the West. Bush chose Iraq as a starting point for the democratization of the Middle East, from where he had expected democracy to spread and, consequently, would both assimilate and contain potential terrorists. When democracy failed to take hold in Iraq or anywhere else for that matter, he initiated an alternative approach, the idea to integrate unspecified “moderate” Islamists into their own countries’ governments. If the Bush method after the Iraq invasion had been largely tentative and reactive, the Obama Administration policy became preemptive; whereby the US would actively encourage, if not directly support, the overthrow of what it considered reactionary Arab regimes. In 2010, Obama ordered his advisors to produce a secret report, later known as Presidential Study Directive-11 (PSD-11), which concluded that the United States should shift from its longstanding policy of supporting stable but authoritarian regimes in the Middle East and North Africa to one backing, what Obama Administration officials considered groups such as the Muslim Brotherhood and the Turkish AK Party, now led by President Erdoğan, as a so-called “moderate” alternative to more violent Islamist groups like al-Qaeda and Islamic State. The disastrous consequences of the Obama-Clinton policies we have witnessed in Egypt, Libya and Syria result, not just from the policy itself, but, to no small extent, from the “zero footprint” manner in which it was executed. The rise of ISIS can be directly linked to the power vacuum left after the premature withdrawal of US forces from Iraq in December 2011 and fueled by American abdication of a foreign policy in Syria, where we sub-contracted our foreign policy to Saudi Arabia, Qatar and Turkey. Not surprisingly, those countries pursued their own interests; the Saudis supporting radical Islamic Salafists, while the Turks and Qataris backed the Muslim Brotherhood, whose goals do not defer markedly from Islamist groups like al-Qaeda and ISIS, that is, a global caliphate and the implementation of Sharia. We are now left with only one short-term course of action: ISIS must be comprehensively defeated on the battlefield by whatever combination of methods and assets. ISIS persists because they appear to be winning. In addition, it has a simple and uncompromising message, one that resonates with the alienated, aimless or unsuccessful. For disaffected Muslims, ISIS can represent a form of Islamic glamour that fills an emotional need both for purpose and redemption. It is an opportunity to belong and be a winner. For life’s losers, it provides a powerful enticement to live out sexual fantasies without consequences and to obtain revenge for real or imagined insults in the form of helpless victims. Piles of dead ISIS fighters, however, make poor recruiting posters. An ideology has little chance to flourish, if there are few left eager to practice it. Yet the defeat of ISIS will not solve the Iraq-Syria conflict and no outside player alone, whether it be the US, Russia, Iran or Turkey, can shape the outcome. The Shiites and the Kurds, for example, do not speak with one voice and the Sunnis have not found their place in a post-Saddam Iraq. It means that each faction and sub–faction will pursue their separate interests, likely resulting in continued or even greater fragmentation. In the long-term, it is not the responsibility of the United States to reconcile all the various opposing faction in the Middle East, but to manage and sometimes leverage the chaos in a manner that fulfills our national security interests. 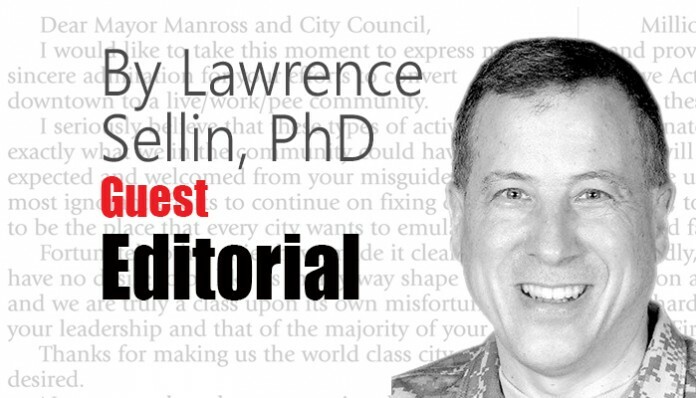 Lawrence Sellin, Ph.D. is a retired US Army Reserve colonel, a command and control subject matter expert, trained in Arabic and Kurdish, and a veteran of Afghanistan, northern Iraq and a humanitarian mission to West Africa. He receives email at lawrence.sellin@gmail.com.